Describing James Thorpe as a great athlete would be doing him a severe injustice. A better description would be calling him the greatest athlete of the 20th Century. This label will probably be debated by many, but Thorpe's accomplishments speak louder than words. King Gustav V of Sweden told Thorpe: "Sir, you are the greatest athlete in the world." James Thorpe was born on May 28, 1887 in a one-room cabin in Oklahoma. Although there is much confusion on Thorpe's date of birth, this is the date according to his estate. His very existence was an excellent representation of the melting pot that was America. He had some French and Irish blood but he was of mostly Sac and Fox Indian heritage. His Indian name, Wa-Tho-Huk, translated to "Bright Path", something that Thorpe definitely had ahead of him. The career biography of James Thorpe reads like an encyclopedia of sports, encompassing virtually every major athletic event available. In the 1912 Olympic Games, he won both the pentathlon and decathlon events. In the same year, he led his Carlisle Indian School team to the national collegiate championship, scoring 25 touchdowns and 198 points. Following the college football season, Thorpe went on to play 6 years of Major League Baseball. Meanwhile, he managed to lead the Canton Bulldogs football team to unofficial world championships in 1916, 1917, and 1919. When he eventually finished his playing days in 1928 with the Chicago Cardinals, James Thorpe had become an athletic attraction that crowds flocked to see. Thorpe died on March 28, 1953. In 1950, the nation's press selected James Thorpe as the most outstanding athlete of the first half of the 20th Century and in 2000, he was awarded ABC's Wide World of Sports Athlete of the Century. Height: 6'-1" Weight: 190 lbs. He played for Carlisle Indian School, Canton Bulldogs, Cleveland Indians, Oorang Indians, Rock Island Independents, New York Giants, Canton Bulldogs and Chicago Cardinals. He was the most famous American athlete of the age. He was excellent at every sport he tried. 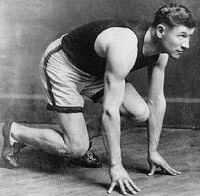 He won the decathlon and penthatlon events at the 1912 Olympics. He did play major-league baseball from 1913 to 1919. Football was his favorite sport. In 1912, Thorpe scored 25 touchdowns and 198 points in leading his Carlisle Indian School team to a national collegiate championship. James Thorpe was selected by the nation's press in 1950 as the most outstanding athlete of the 20th century. James Thorpe was also declared as "America's Greatest football player of the half-century," in 1950. 1. Believe it or not, a player once hit 3 home runs into 3 different states in the same game...Olympic champion James Thorpe played in a semi-pro baseball game in a ballpark on the Texas-Oklahoma-Arkansas border...He hit his first homer over the leftfield wall with the ball landing in Oklahoma...Then he hit a homer over the rightfield wall, into Arkansas...His third homer of the game was an inside-the-park home run in centerfield, which was in Texas! 2. Thorpe is one of two men in history who played for both the New York football (running back) and the baseball (outfielder) Giants. 3. Thorpe played football professionally well past his prime, retiring in 1928 at age 41. 4. James Thorpe played major and minor league baseball for 20 years, starting with the New York Giants in 1913, later playing for the Boston Braves and the Cincinnatti Reds, plus several others. 5. Thorpe was the first president of what is now the National Football League. World's Greatest Athlete - this title is traditionally given to the Olympic Decathlon champion.